Zoe Kleinman tries out Acrossair's software that uses a phone's camera to tell you where the nearest London Underground station is. Via the video function of a mobile phone's camera it is now possible to combine a regular pictorial view with added data from the internet just as the fictional Terminator was able to overlay its view of the world with vital information about its surroundings. For example, UK-firm Acrossair has launched an application for the iPhone which allows Londoners to find their nearest tube station using their iPhone. 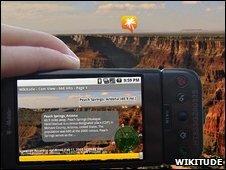 Mobilizy has shown off its Wikitude world browser which presents users of phones running Google's Android operating system with information about real world objects submitted by users. AR is a precocious new technology; a spin-off from virtual reality (VR). But unlike VR, which seeks to persuade you that you really are in a fantasy place, AR enhances perception of the real world. Not only could this form of rich, intuitive and easy to grasp data be the next killer app for the mobile, some see it changing our world view forever. "The biggest significance of mobile phones as media is that they have increased our closeness to virtual reality," says Japanese writer and net culture guru Toshinao Sasaki. "Because compared to PCs, mobile phones are with us for much longer hours." The sudden democratisation of smartphones, which for the most part are powerful, tiny, portable computers, is beginning to make cyborgs of us all, he says. In addition, Mr Sasaki says, they will help erase still further the already disintegrating barrier of what we see as reality and non-reality, private and public. "While the internet sphere and the reality sphere had previously been completely separate as 'virtual and non-virtual,' mobile phones have rapidly shrunk the distance between them." Now, says Mr Sasaki, the virtual sphere is likely to merge seamlessly into reality because of the arrival of AR. "Eventually, it seems possible that mobile phones might play the role of a kind of supplementary brain," he says. To the Japanese, and elsewhere in the mobile-centric world, mobiles are essential tools that help us navigate around an increasingly complex world. Ubiquitous AR will likely increase this reliance further. Already Japan is an avid consumer of location-based services and thanks to a 2007 law all Japanese phones must come with GPS to help with "law enforcement". It was just a matter of time until somebody united the thirst for user-generated content, the mobile, and the real world. Step forward Tokyo-based smartphone app developers Tonchidot, which recently revealed a beta, or test, AR application for the iPhone called Sekai Camera (World Camera). It's where AR meets social networking, the company says. 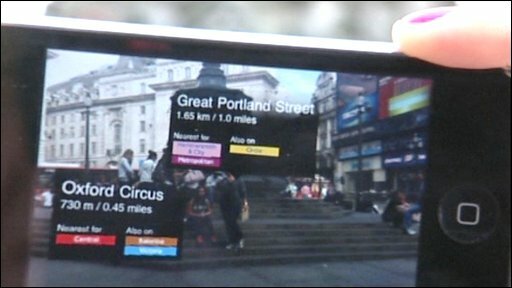 Promotional video for the Sekai camera application, that calculates your position using GPS and images, then displays information over your real-world view. "Sekai Camera really improves communication between individuals and companies," says Takahito Iguchi, the application's creator. "It generates a new, fourth dimension everybody has dreamed of." By combining a smartphone's camera, GPS, and net connection Sekai allows social tagging, or "Air Tagging" as Tonchidot describes it, of the real world through the mobile screen. Using the phone's built-in GPS, Sekai calculates your position. The viewfinder for the camera then displays location-specific information graphically on top of your real-world view. For example, if you feel peckish in a shopping centre you could use the application to scan the shops for a place to eat. The software could also display menus and reviews. It is similar concept to Mobilizy's Wikitude app. But Sekai Camera allows individuals and businesses to add their own information including text, images, and sound. One user describes the experience as "having an informative, manga-like world superimposed on the real one". A filter will be offered, says Tonchidot, so that users remain in control. 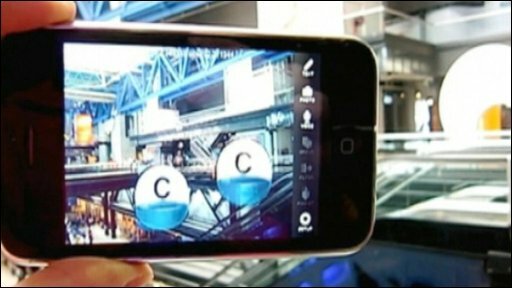 At the Tokyo launch of the trial version, invited guests could tap a tagged object seen through the iPhone and up popped a window with info - a picture with a comment box or a spoken message created earlier by a tagger. Tags can also translate to coupons from businesses or travel tips from friends. Tonchidot says it is now working with Softbank Mobile, one of Japan's big 3 mobile carriers, to amass enough tags for the soon to be announced Tokyo release. Elsewhere developers have been scrambling to get their apps on high-profile handsets such as the iPhone or those using the Google's Android platform. For example, Google boasts the likes of a stargazer application called Sky Map which allows a user to identify constellations by simply pointing their phone at the night sky. Perhaps the most advanced service is SPRXmobile's Layar service. Launched this June in Amsterdam, residents and visitors can now see houses for sale, popular bars and shops, jobs on offer in the area, and a list of local doctors and ATMs by scanning the landscape with the software. 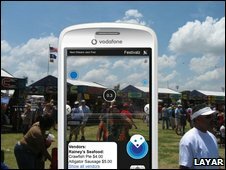 an equivalent to the internet browser but now for the real world," explains Maarten Lens-FitzGerald, a Layar co-founder. "It's a new and more natural way of being more knowledgeable about what is around you. It also helps you experience things you didn't know about before." The Dutch company says it plans further rollouts globally, and is now working with location based info providers and estate agents in Germany, the UK and the United States to bring similar services soon. Whatever the cybernetic implications this means we should be seeing more of AR in every sense. Additional reporting by Yasuko Amahisa in Tokyo.